The Beer Book is Here! 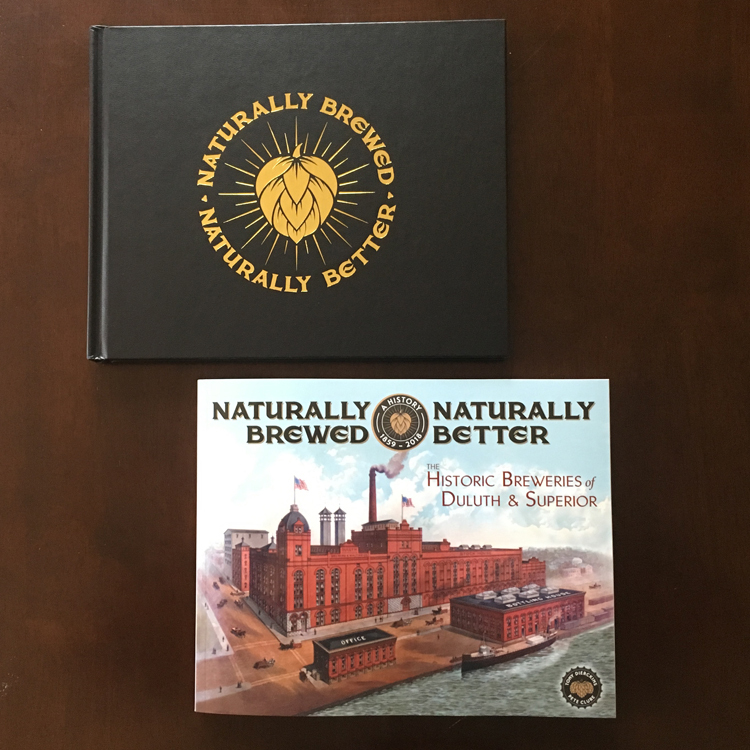 Copies of Naturally Brewed, Naturally Better: The Historic Breweries of Duluth & Superior have arrived just in time for this Thursday’s launch celebration! Special thanks to Tobbi Stager and his crew at J.S. Print group for helping us get the book manufactured and delivered on time. Thanks to their pre-press staff, the images—all 585 of them—look fabulous! And the gold-leaf cover on the limited-edition hardcover—which you can only get at events and online at Zenith City Press—is stunning. Scroll down to see images of the book, and click HERE to preview or purchase the book (ships this Friday!) and HERE to find out more about Thursday’s book launch at Clyde Iron Works and our four other author events in October. The limited-edition hardcover (top) includes a dustjacket that looks just like the softcover edition (below). The printed endpapers of the limited-edition hardcover. Tony & Pete! Congratulations on your amazing new book. You two have created something really special here. From the history to the story-telling to the images… like a delicious local brew made with Lake Superior water… your book is well balanced, multi-layered, and something I’ll open up again and again. Nicely done fellas. Thanks, Dave! Looking forward to the Duluth Experience’s new Beer History Bus Tours! We love writing the history, you guys bring it to life!